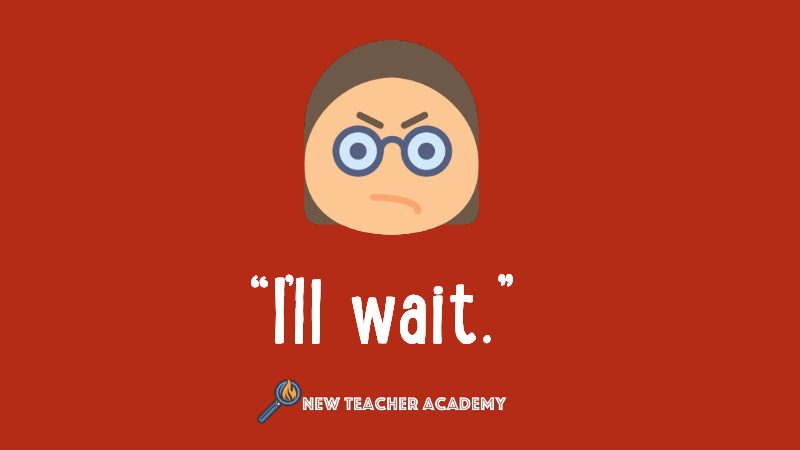 Most teachers have been through this exact scenario: You try to start class with a line like, “Okay everyone, we’re going to get started.” And a couple students might glance up at you, indignant that this teacher is bothering them. So a little louder you say, “Everyone! Time to start class.” This gets the attention of a few more students, but still the majority of kids keep talking to each other, ignoring the fact that their teacher is in the front of the room with a face that is becoming redder and redder. Finally, you lose your temper, RAISE YOUR VOICE, the room goes quiet, and you are left feeling a little embarrassed, and even more, frustrated that it takes yelling to get your class’ attention. Struggling to start off class or return from a group activity is a challenge every teacher faces. However, as important as it is to get your students’ attention and be as efficient with time as possible, it doesn’t have to be difficult. Here are 10 ways to get the attention of even the noisiest group of students without raising your voice or losing your cool. Having structure to the time students spend in your class can help eliminate the chaos of getting their attention. If you have a screen in your room, project a timer for each activity they are working on. That way, students can see how much time is left and when they will need to redirect to the teacher. If you have an Amazon Echo in your room, you can tell Alexa to set a timer for ___ minutes. This way, there will be no surprises when you have to get your class’ attention (and Alexa can call them back for you). 2. Stand in the Middle of the Room. Use proximity to students to your advantage. If you are standing at the front of the room, you may be close to the students in the front, but are a whole classroom away from kids in the back. When getting their attention, stand at the middle of the room where you are closer to every student. If there is a certain group of students who have more trouble redirecting, stand near them when calling the class’ attention. This one can be difficult at first, and it can seem counterintuitive to stand in the middle of the room and say nothing. However, this is possibly the best way to get your class’ attention. Here’s how you do it: Say one time, “Okay everyone, I need your attention.” Then stand and wait. It will probably not get instant results the first time, but students will notice you standing there waiting for their attention, and like magic, will give it to you. You’ll see students turn and quiet each other and do all of the work for you. I’m not sure if it’s out of shame for making their teacher stand quiet for so long or some type of teacher-Jedi-mind-trick, but pretty soon the time you have to stand quietly vanishes. Kids know you will stand until you have their attention, making them feel awkward, and so give attention immediately. 4. Use Call and Response. You get the idea. It’s a fun way to get attention and get everyone on the same page. Every class has them, those students who help shhh everyone else and make sure everyone is following the rules. While sometimes these students can be a little overbearing and annoying, they can also be a valuable asset to your class. When this student is trying to quiet their classmates as you stand silently at the front (see #2), make sure to thank them publicly when the class gets quiet. This shows your gratitude to that student and encourages them to continue assisting you, and also sends the message to the class of what the expectation is when the teacher is trying to get attention. 6. Have a Countdown Call-Out. Instead of calling for your class’ attention out of nowhere, give them a 5 second warning. Try saying, “With me in 5. With me in 4. With me in 3. With me in 2. With me in 1.” By the time you get to one, students will have had time to wrap up conversations or finish what they were doing and give you their attention. 7. Turn on a Special Light. Have a light in a central place in the room, that when turned on, means you need the class’ attention. This could be a lamp, stoplight, lava lamp, disco ball, or any other type of light that gives students a visual cue to turn their attention. This one is for your “auditory students.” Play mooing cows, chirping birds, or howling monkeys through classroom speakers when you need students’ attention. Not only is it funny, but it will be sure to get the attention of your students when you need it. Because let’s be honest, who is going to carry on a conversation with pigs oinking in their ears?! *Pro tip: Let students decide what animal will be played through the speakers each day. It’s fun for them, and makes sure the whole class knows what sounds to listen for when it’s time to refocus attention. This is the timeless classic that has worked across generations. It goes like this: Say aloud, “Clap twice if you can hear me.” Students who hear you will clap two times. Now say, “Clap 3 times if you can hear me.” More students will join in clapping. For the third time say, “Clap 11 times if you can hear me.” By now, there is no chance that there is a student in the room who does not know that you need their attention. Kids get to burn a little physical energy and you now have their attention. Timeless. Magical. And the most effective of all of these attention-getting techniques is of course to build relationships with your students. When students feel trusted and respected by their teacher, they will return that trust and respect. This is why the best classroom management starts with relationships. Simply put, kids will give their attention to teachers they know care about them. So the most effective way to start class quickly and get your students’ attention is to care about them and make sure they know it. Join the community for new teachers here at our Facebook Group.